"If your great umbrage would care to meet my high dudgeon at twelve paces, I would be happy to entertain you at dawn. In public or in private, with sword or pistols, or if you please, with tomahawks, sir." 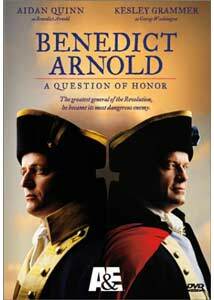 There are few names as reviled in American history as that of General Benedict Arnold. However, through much of the Revolutionary War, Arnold was considered one of the fledgling country's greatest heroes, with a number of successful campaigns against the British under his belt and the unparalleled devotion of his men to his credit. This biopic takes a look at what caused this man to betray his country in such a brazen manner that Congress ordered that his name never be carved in stone or metal. The film begins in the midst of the war, as General Washington (Kelsey Grammer) urges promotion of Arnold (Aidan Quinn) as a hero capable of bold strokes. Instead, Congress promotes the vacillating and timid General Gates (Michael Grannell). This, combined with the recent death of his wife, his own bankruptcy and the failure of Congress to provide him with three years of back pay, sets Arnold on a new route. Appointed as military governor of Philadelphia, he determines to make as much as he can for himself by profiteering and using army wagons to ship goods. While in Philadelphia, he is bewitched by the young Peggy Shippen (Flora Montgomery), who comes from a Loyalist family. Once married, the mob turns against him, and his wife convinces him that his talents would be better appreciated by the British. As a result, he hits upon a plan to deliver to the Redcoats not only the key fort of West Point, but the person of General Washington himself. While the film appears to be more or less accurate historically, it does have a tendency to be a bit on the preachy side, with some awkward political exposition. There's also an unhealthy amount of talk of America as being under the Hand of God, which only encourages the jingoistic tendencies of the country even today. However, where the picture excels is in making the betrayal of Arnold both understandable and credible. Indeed, the forces allied against him make it seem even natural in a way that he would turn traitor; one would need to have the strength of character of a Washington to resist. Aidan Quinn does well in the title role, conveying enough of the passionate hothead (given to dueling and brawling) that the rest of the pieces fall properly into place. One gets the feeling that this Arnold could literally have been capable of anything, for good or for ill, and that lack of proper encouragement was a critical factor in the outcome of his fortunes. Surprisingly excellent is Grammer, who sheds most of his comic persona to give his George Washington both a heroism and a humanity that so seldom coexist in screen portrayals of Great Men. Whether Grammer had anything to do with it is unclear, but his Washington does not succumb to the tendency to speechify that hits most of the rest of the cast. Montgomery is a bit of a weak link here, though much of the more extreme material (such as her dissembling mad scene at the end) appears to be supported by contemporary records. While there is a little bit of battle here, the emphasis tends to be more on the aftereffects than the action itself; several gory sequences of après-battle surgery will not be easily withstood by any but the most confirmed gorehounds. The romance tends to be a bit perfunctory and by the numbers. Oddly enough, the most compelling portions of the program are the political discussions, propelled largely by Grammer's outstanding performance. Image Transfer Review: The original full-frame transfer looks quite good overall. Detail is fine, with excellent color. The sequences in forests have a slightly digital appearance, and aliasing and shimmer tends to be present at annoyingly regular intervals. As a brand new production, there is appropriately no film damage visible. Audio Transfer Review: The 2.0 audio is quite acceptable for a television movie. The cannon blasts have a good depth, though the very lowest frequencies are lacking. Hiss and noise are nonexistent. Dialogue is quite clear throughout, and the music (present in the surrounds) has a very pleasing quality to it, particularly the string orchestra during the ball sequence. Extras Review: The disc features two documentaries. The first is a 'making of' (22m) that is mostly an electronic press kit with happy talk about the stars and describing the story. However, there are also present here several deleted sequences of conversation between Washington and Arnold, making the documentary valuable nonetheless. Probably cut for running time, the scenes are definitely worth viewing. More substantial is the 1995 episode of A&E's Biography (45m:19s). This forms an invaluable counterpoint to the feature film, since it gives emphasis to Arnold's earlier years and also gives substantial coverage to Arnold's life after his treason. This helps fill out some of the motivations that are only hinted at in the film, providing a more well-rounded portrait of the man. Nothing here seems to contradict what is presented in the film. Wrapping up the package are some brief 2-screen bios of Quinn and Grammer, as well as what appear to be fairly complete filmographies. A compelling look at what creates a traitor, with some excellent lead performances and some very worthwhile extras.